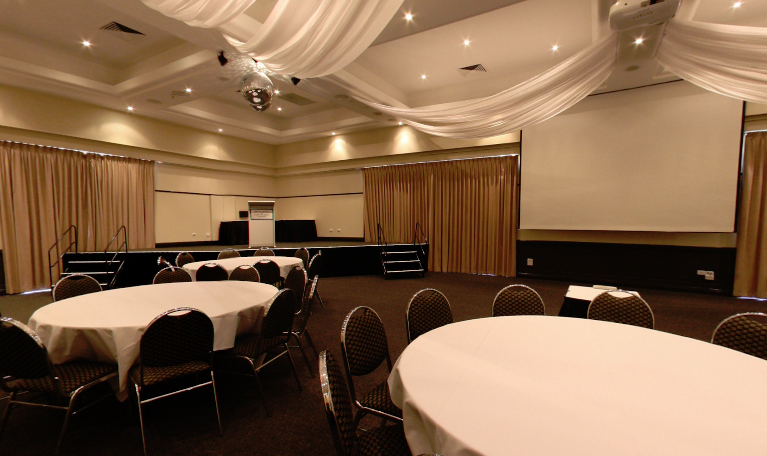 The Waterford Room is the largest function room within the separate Fitzys Loganholme Function and Convention Centre. With seating for 120 and standing capacity for 200 people, the room is set up to cater for large events. The room features a large stage, data projector and large screen and full conference facilities. The equipment is all state of the art technology, making it ideal for corporate functions  from training sessions through to large expos. The room is also one of the best wedding reception venues in Brisbane, with event staff who can tailor packages to suit all requirements. The award winning restaurant can take care of all food and beverage requirements, with cocktail platters, buffets and plated meal packages available. All together it is a modern function room with first rate facilities, dedicated event staff and competitively priced packages that make this one of the best function rooms Brisbane has to offer. As a large space, the Waterford Room is also perfect for all types of corporate seminars and conventions.